A new publication, added by Transparency Market Research (TMR) to its repository, provides a comprehensive analysis of the diesel gensets market in Kuwait, stating that the industry is expected to have a booming future in this region.According to this market study, titled “Kuwait Diesel Gensets Market - Industry Analysis, Size, Share, Growth, Trends, and Forecast, 2014 - 2023”, in 2013, the Kuwait diesel gensets market stood at US$49.1 million. It is expected that this market will register growth at a CAGR of 5.0% during the period of 2014 to 2023 and will reach US$79.7 million by the end of the forecast period.The construction industry in Kuwait is thriving, with a series of new projects set to be completed in the near future. However, this region has faced major problems of power supply shortage in recent times. Consequently, the demand for diesel gensets is expected to rise in the coming years as diesel gensets, apart from being a steady source of standby power, are also utilized for continuous power supply in large construction projects. On the other hand, the added power generation capacity and increased deployment of renewable energy in this region is likely to curb the dependency on diesel-fueled power solutions limiting the market for diesel gensets in Kuwait. Presently, in Kuwait, the rental diesel gensets market generates more revenue than the new diesel gensets market, and is thus considered the dominant segment based on product type. Contractors and operators of infrastructure projects to be constructed in Kuwait are projected to be the main consumer segment of rental diesel gensets. For new diesel gensets, the major buyers are the end-use industries in the region that employ diesel gensets as a source of backup power.In 2013, the market for diesel gensets having a capacity of 0-75 kVA was the key market for new diesel gensets in terms of units installed. However, the diesel gensets market in the 500-2000 kVA capacity group generated the highest revenue and held the largest market share in 2013. The residential sector utilizes these gensets as a source of backup power, whereas the hydrocarbons and defense industry often uses these as prime power sources. 500-2000 kVA and over-2000 kVA diesel gensets are generally employed in large establishments as a source of standby power. Various large industrial users such as airports and refinery complexes deploy such large diesel gensets for power backup. The major participants in the Kuwait diesel gensets industry are Kohler Co., Caterpillar, Inc., FG Wilson Ltd., Cummins, Inc., MTU Onsite Energy GmbH., and Aggreko Plc. Several projects for new refineries and port construction as well as expansion of existing ones are planned in the coming years in this region. 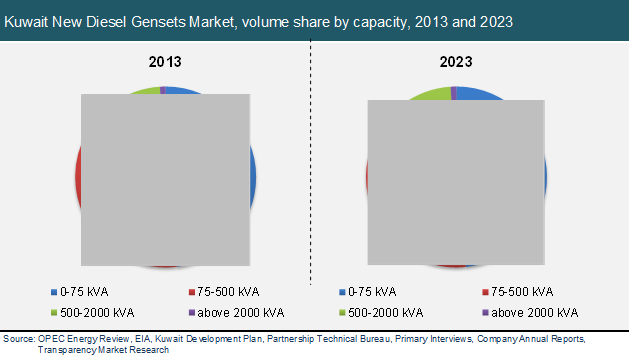 These projects are expected to extensively propel the demand for diesel gensets in Kuwait during the forecast period.